On a recent afternoon, the skateboard park was the most populated section of gritty DeFremery Park in West Oakland. In this working class area, with unemployment, crime, violence and gentrification, just under the giant shipping cranes from the nearby Port of Oakland, a dozen skateboard enthusiasts, boys and young men, glided up and down the complicated series of ramps and jumps over and over, without saying a word. The calm was was suddenly interrupted by the arrival of The Original Scraper Bike crew. This is a neighborhood where, much like boys everywhere, youth spend their summer days gazing at the passing traffic, fantasizing about the car of their future, the car of their dreams. But unlike their more affluent counterparts with stable homes and intact families, a car of one's own may be financially out of reach. After all, how many boys from this struggling neighborhood, in a bad economy, will be able to purchase and maintain a customized automobile, when one week, they may "stay with" their grandma, and the next, at their "play sister" or "auntie's" house? Where "family stuff," spoken with downcast eyes, is the reason given for not being able to stay in school or keep a job? A viable alternative to a dream car is these dream vehicles, the scraper bikes. They are as personalized and attention-getting as "scraper" cars, but easier to afford, better for the environment, a healthy way to exercise and an outlet for creativity and mechanical skills. Those scraper bikes are the stuff of the candy-coated dreams of youth: of speed, of empowerment, of being noticed in the crowd. The Urban Dictionary defines "scraper bike" as "a relatively recent phenomenon from the Bay Area (specifically Oakland) in which people modify used bicycles to resemble (either functionally, aesthetically or philosophically) the famed "scraper" cars of the "hyphy" movement." "Scrapers" are essentially 20th century American sedans, customized with large wheels, candy-colored paint jobs, immense sound systems and hydraulics that "when one dips or presses the gas and steps on the brake simultaneously the front and back bumpers SCRAPE the ground." Cars like these have been the focus of illegal "sideshows" where young people cruise the streets and perform risky tricks with their tricked-out vehicles. 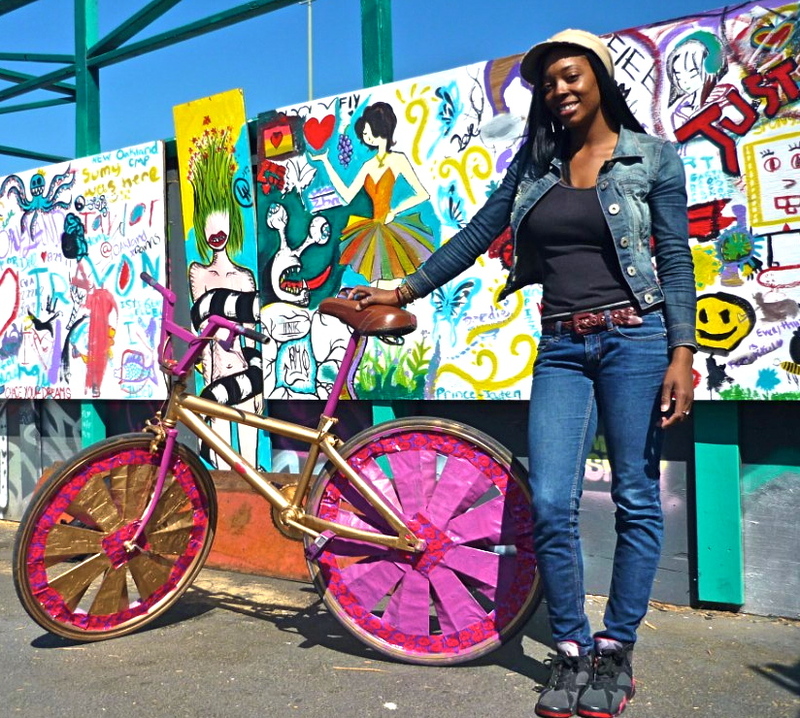 So when a dozen Scraper Bikers rode onto the blacktop near the skate park, all eyes turned to the colorful parade of bicycles built, repaired and decorated by neighborhood youth. 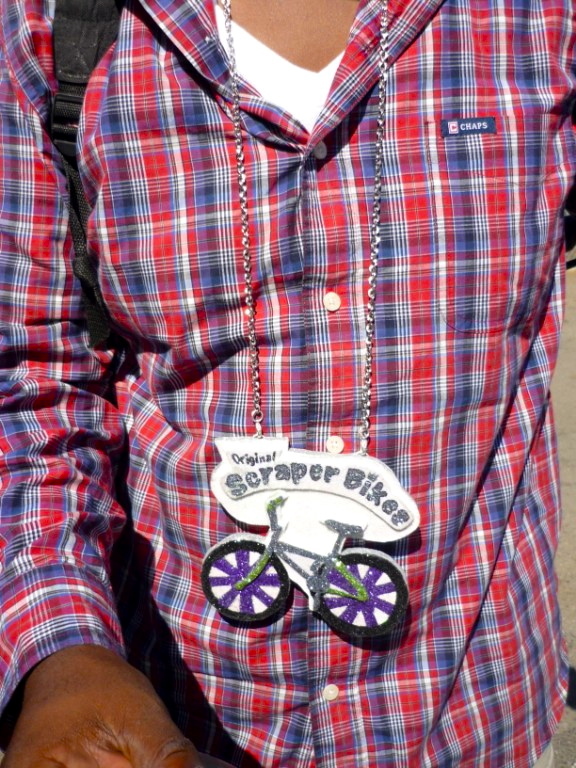 As usual, today's ride was led by 23-year-old Tyrone "Babye Champ" Stevenson, AKA The Original Scraper Bike King, founder and CEO of the Scraper Bike movement, wearing a red plaid shirt and his trademark "Scraper Bikes" medallion. On this day, the bikers were special guests of Sony Pictures at a special event, tied to the release of the film, Premium Rush on Friday, August 24. The film, starring Joseph Gordon-Levitt (The Dark Knight), is a big-budget, PG-rated action-adventure thriller, tailor-made for the urban bicycling crowd. It's big city, car-chase action, but with bikes. Gordon-Levitt's character is a daredevil Manhattan bike messenger who rides a "fixie," a customized bike with only one gear and no brakes. One of his deliveries leads him into an undercover world from which he must escape the only way he can--by pedaling furiously through city streets, dodging cars, taxis and pedestrians and riding like hell. The film reflects the growing nationwide interest in bicycling as both a pastime and a healthy way of life. The scraper bikes were arrayed in car show fashion, as their proud owners recited the "specs" of each: parts used to construct the frame, wheel size and type, decorative theme and custom details. Contestants ranged in age from 14-year-old Charlie Davis (riding the simplest design) to 36-year-old Kevin "K.B." 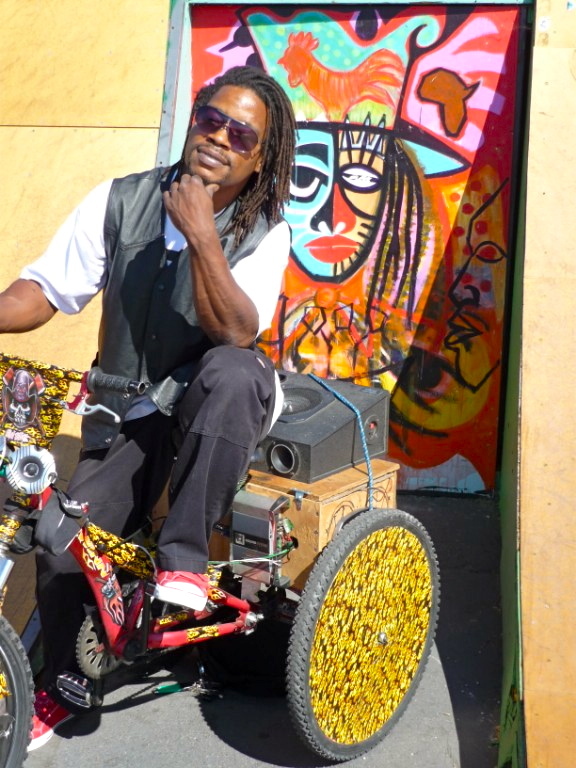 Baltrip, riding a 3-wheeled "dunk" style bicycle, customized from a BMX frame with mountain bike shocks, 20" wheels and a 400-watt sound system blasting roots reggae music. Amber Shorter, a 25-year-old former track runner, is the only young woman in the group. Her rig is what she calls a "girly" bike with lavender wheel rims and handlebars, a metallic gold spray-painted frame, and spokes decorated with foil tape, spray painted hot pink and lavender, bordered by a design crafted from strips of foil tape emblazoned with red-lip "kisses." When asked why she rides with the Scraper Bike crew, she replied, "Well, I started it to ride with my boyfriend R. B., but then I got hooked. Riding out here makes me feel good. It eases my mind. I like getting the attention. From me being the only girl, I'm the only one out (of) the pack that everybody likes the most, because of my bike. Since it's mine, it's all girly and nice. So if they see my bike, it might give the little girls an idea to join and then probably find a theme for their bike, to come ride and be on my team." It's true; these bikes are contagious. Each handmade bike was more colorful than the last, with fanciful colors and a hypnotic effect created by spinning the wheels in the sunshine. But it was the "Mario" bike by 17-year-old Nick Bravo which won First Place. It was clear from his presentation that Nick had spent a lot of time and concentrated effort preparing "Mario" for display. Several months were spent just trying to earn enough money to purchase three small cans of paint for the red, white and blue details and the title character Mario Brothers stuffed toy, affixed to the handlebars. Nick's was the only scraper bike in the contest that qualified as a genuine "fixie." "I like riding a fixie because I have to keep pedaling. It's more of a challenge and I like a challenge. Without brakes, I have to pedal against the fixie to stop. And it's faster than all the other bikes here." Earnest, cheerful Nick described his excitement about cycling and about his dreams for the future. When told he was the winner in the "Best Scraper" contest and would receive the new bike, Nick beamed. "My goal in life is to be a mechanic. I love working on bikes and I love making people happy. That's why I ride this bike, to see the smiles from the people. It makes them happy, and myself at the same time." The Scraper Bike movement was created especially for youngsters like Nick, to teach inner-city kids to repair and rebuild bicycles while contributing to the environmental concerns of their polluted, industrial neighborhoods. lectured at the University of Wisconsin and been profiled on NPR. The principles of the scraper bike movement have spread nationally and internationally, but here in this low-income, portside Oakland neighborhood, scraper bikes are a sign of the times and the harbinger of the increased popularity of biking within the black community. Concerns over obesity and a lack of environmental awareness in the African American community have spawned several grassroots "urban" bicycle groups in the Bay Area and the movement is spreading nationwide. The focus is not just on children, but adults as well. One such organization, Red, Bike and Green, was founded in Oakland in 2007. Five years later, it has grown to include chapters in Atlanta and Chicago, with Brooklyn and New Orleans chapters in development. According to one of the core organizers, Jewels Smith, with the group's "3-Point Plan" the goal of RBG is to improve the health, economic vitality and environment of African Americans, by "trying to build a sustainable bike culture within the black community." One place to ignite that culture is with the youth. 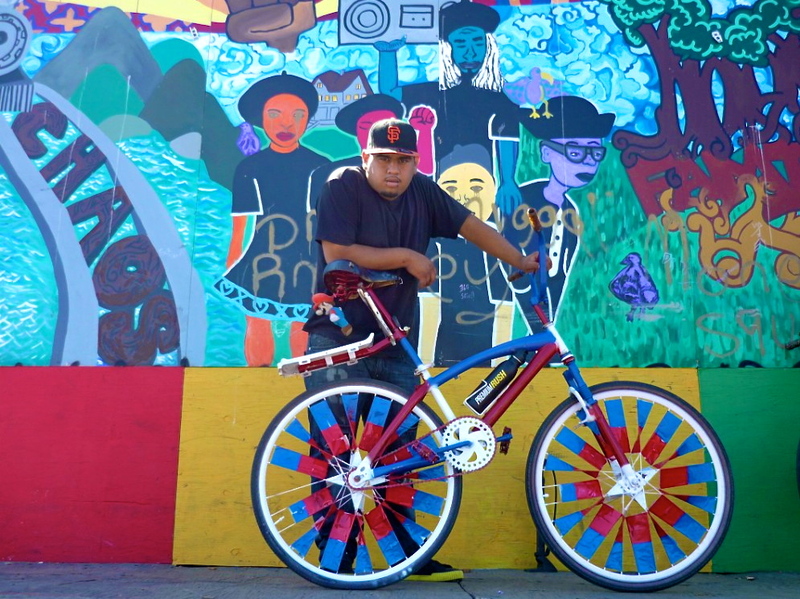 Fresh air, creativity, positive attention, exercise and a sense of community are being provided by the Scraper Bike movement in Oakland as an alternative to days spent indoors with TV or video games--or worse. Tyrone Stevenson, the founder, states openly that he believes his involvement with scraper bikes literally saved his life. Once a troubled youth, involved with illegal activity, he recently enrolled in community college and dreams of one day owning a neighborhood bike shop. After growing up as a boy from East Oakland with no surviving male role models, he has emerged as a leader of other young men in the same situation. His Myspace Page, written several years ago, lists as his influences: "MY FATHER, GRANDFATHER, AND LITTLE CUZIN IS WATCHIN OVER ME SO WIT THEM AS MY MOTIVATION AND GARDIEN ANGLES IM GOING TO MAKE IT OUT THE HOOD....."
As the contestants began to unwind from an afternoon of parading and presenting their two- and three-wheeled creations, the park's skateboard and bicycle contingents gathered together on park benches to enjoy a snack and talk about what else? Bikes and skateboards, of course. As a reporter left the park, the sound of their laughter and chatter diminished and the strange quiet of the empty streets and sounds of automobiles crowded out their voices. Driving only a few blocks from the park, suddenly the streets were closed in several directions. Oakland Police blocked the routes, their black-and-white cruisers parked diagonally across the streets, with red, white and blue lights swirling in the saturated light of an early evening sun. Police stood on the sidewalk interrogating several young black men with hands tied behind their backs. The portside Oakland sun almost seemed to bring additional heat to the situation. Too bad; if those young men had been at the park, repairing and riding bicycles with "Babye Champ" and the Scraper Bike crew, they may have had a much better day -- and a better life.